Abe no Seimei (安倍 晴明 Abe Seimei) is a human esotericist from Gi'on. He is 27 years old during the event of The Story Begins, 167 cm tall and weighs 65 kg. He has an ambition to create life, in which he stumped. One day he finds out about Kouki and researched it. During one of his break at a local pub, he met a foreigner couple, Artair and Evangeline. Seimei listens to their story and offered to help with his wide arrange of knowledge. In battle, Seimei uses enchanted paper talismans and wields a ceremonial blade named Makai Tensei Tsurugi (魔界転生剣 Demon World Reincarnated Blade). 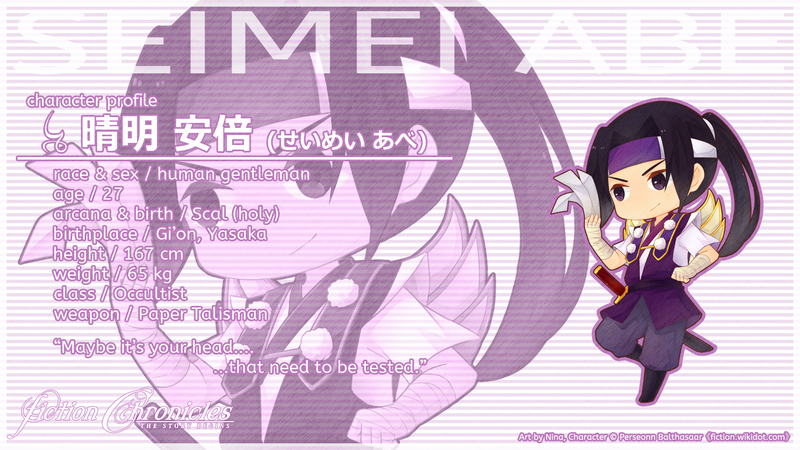 Seimei has black eyes and black hair in a ponytail. He is protective of his creations, but also firm in upholding established rules. He was almost always seen with his lavender keikogi, his red shinsen vest, and his white scarf. Artair once commented on how good Seimei's fabrics are. Seimei's journey represents his belief system that helps others deal more comfortably with the unknown and the unpleasant. He needs support in the situation. In the end, however, he will have to face things by himself. I had a problem in which his robe won't fit well unless he's using a hakama. He turned out a bit generic, but retains his signature look. Least gaudy costume among all of his versions. 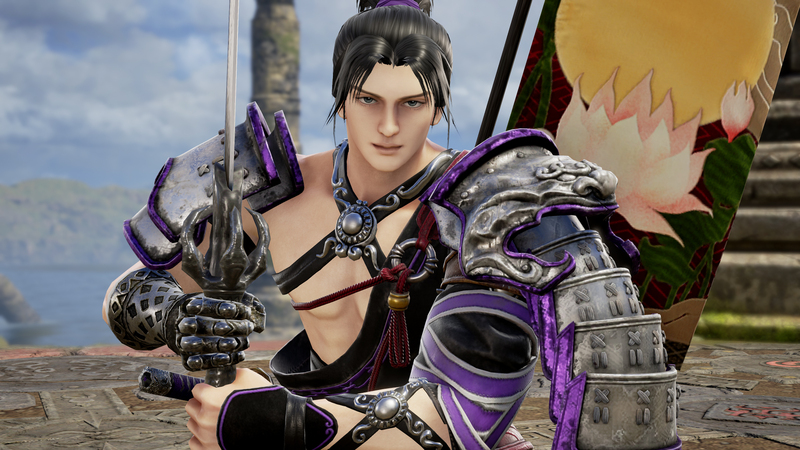 This is modeled after his look in Samurai Warriors 4. I like the outcome, despite the limited color slot for SCBD. 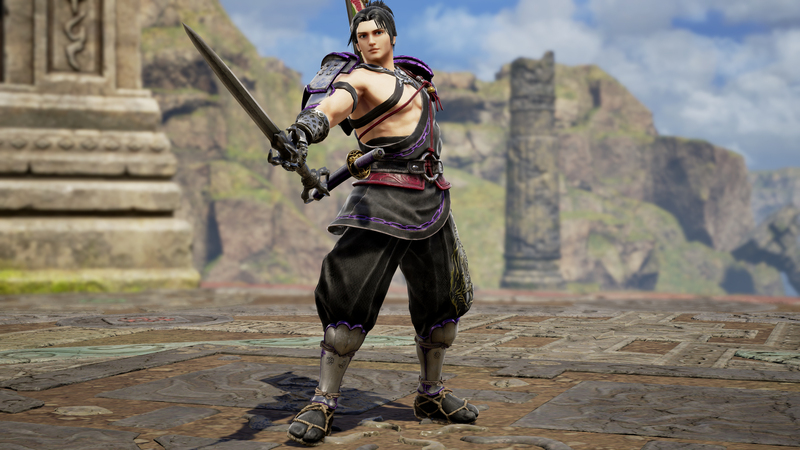 Seimei (taken from Abe no Seimei) is my attempt to use Yoshimitsu's moveset without worrying about the out-of-place flag. He is somewhat a mix of a Samurai and an Easterner in the Taisho era, sporting a scarf and boots. Keeping his look from Soulcalibur V. His face in here somewhat looks mean. An updated version from his 7E costume, with SW4 influences. The Ascetic set or, Tengu set strengthen his image as an onmyouji.